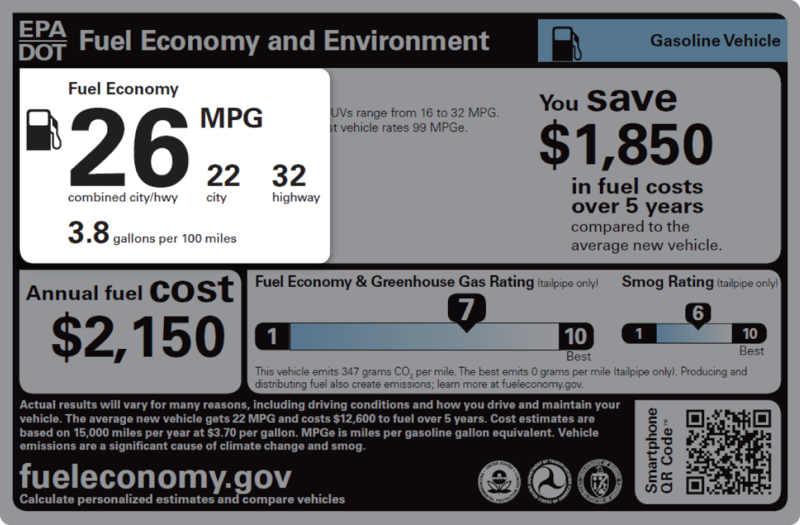 Most prominent on the EPA label for gasoline vehicles is the combined city/highway fuel-economy figure; in this case, 26. It’s calculated based on 55 percent city driving and 45 percent highway driving, so it’s roughly an average between the city rating (22 in this case) and the highway rating (32). Note that for most conventional (non hybrid) gasoline-powered vehicles, the highway rating is almost always the highest, and thus is what’s commonly quoted in ads—even though few people will ever achieve that figure. “Small SUVs range from 16 to 32 MPG.” What this tells you is that the vehicle on which this sticker appears is considered a small SUV. The MPG range given is for combined figures, so this SUV’s 26 rating is about mid-pack for vehicles of its type. 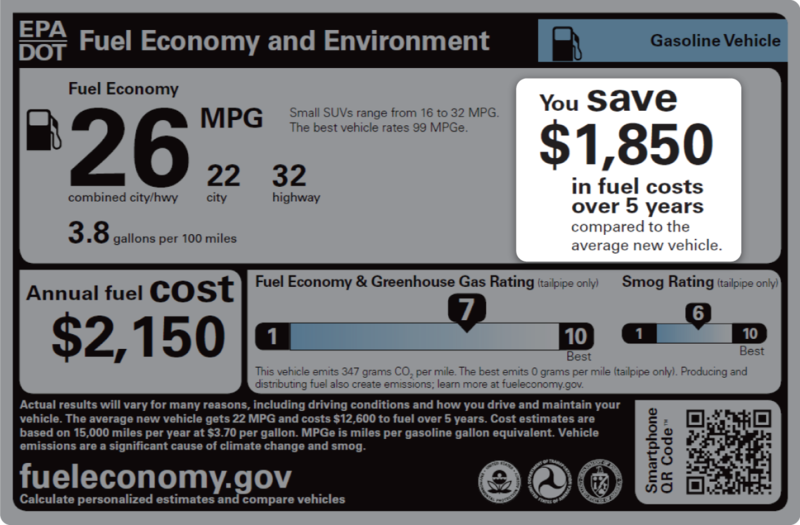 “You save $1,850 in fuel costs over 5 years” is based on the combined MPG figure for this vehicle (26) compared to the average new vehicle—which the EPA says gets 22 mpg—driving 15,000 miles per year on gas that costs $3.70 per gallon. Fuel costs are calculated based on driving 15,000 miles per year averaging the combined EPA rating (here, 26 mpg) with gas at $3.70 per gallon. 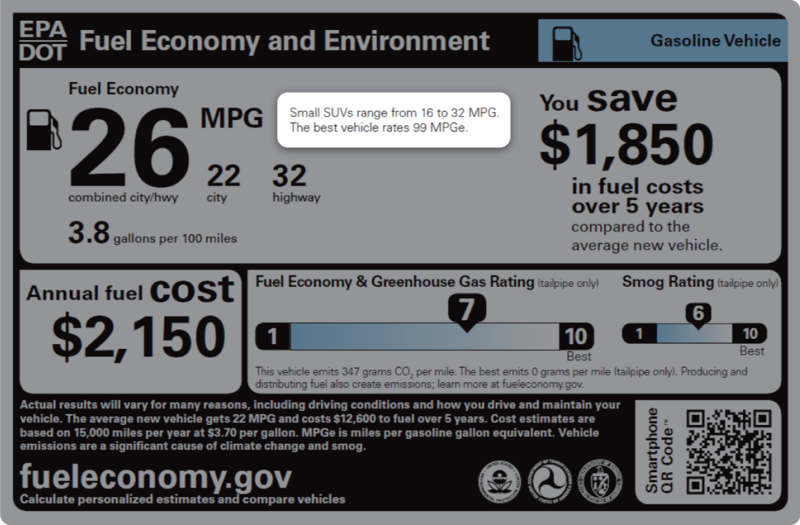 Fuel consumption and greenhouse gas emissions go hand in hand (each gallon of gas burned emits a given amount of greenhouse gases), so this chart says that the vehicle in question is better than average in this regard. Since electric vehicles don’t use gasoline, they can’t very well be given a conventional “MPG” (Miles Per Gallon) rating. 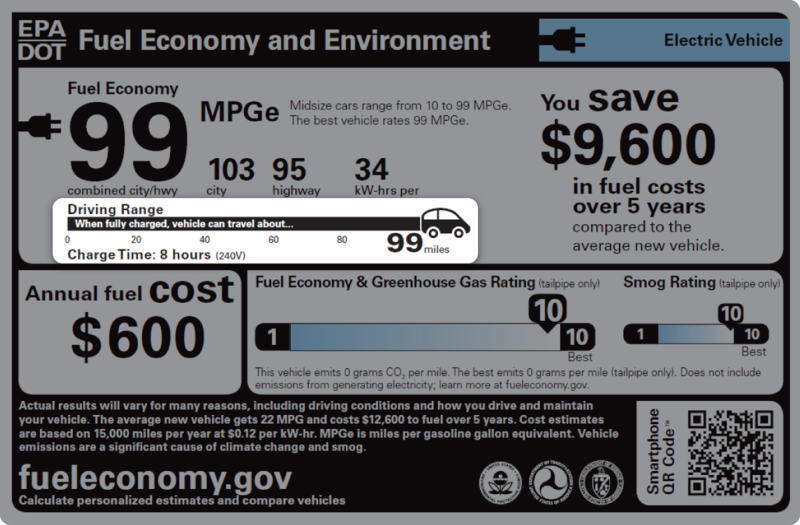 Thus the EPA has devised the “MPGe” rating for electric-powered vehicles, meaning “Miles-Per-Gallon equivalent.” The “equivalent” has to do with the energy content of electricity vs. gasoline, not cost, but it’s still a good “ballpark” figure to use as a comparison. One of the biggest concerns with electric vehicles is the range they can travel before the battery “dies.” The EPA tests this and lists it as the “Driving Range.” More so than in a gas-powered car, this range depends on outside temperature, as using the heat or air-conditioning consumes electric power from the same battery that’s used to propel the car. Using the heat, for instance, can reduce your range by as much as 30 percent. 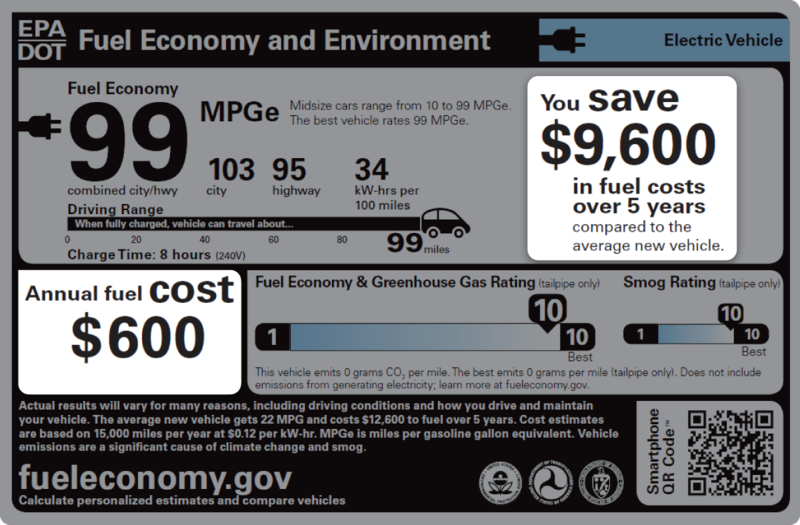 A better comparison of the cost of driving an electric vehicle vs. a gas vehicle is found in the “Annual fuel cost” section along the left edge of the label (here, $600), along with the figure in the top right that says—in this case—“You save $9,600 in fuel costs over 5 years.” Those figures are based on driving 15,000 per year and paying 12 cents per kilowatt-hour for electricity vs. driving a gas-powered car that gets 22 mpg on $3.70-per-gallon gas. Every new light-duty (passenger) vehicle sold in the U.S. is required to have a “window sticker.” The official name is the “Monroney” sticker, named after the congressman who sponsored the bill requiring them. At first they were primarily intended to list equipment and prices, but they have since been expanded to include crash-test ratings and EPA fuel-economy estimates. It’s the EPA label we’re concerned with here. It usually takes up about one-fifth of the entire window sticker and can be placed anywhere on the sticker; it looks similar to those shown above. 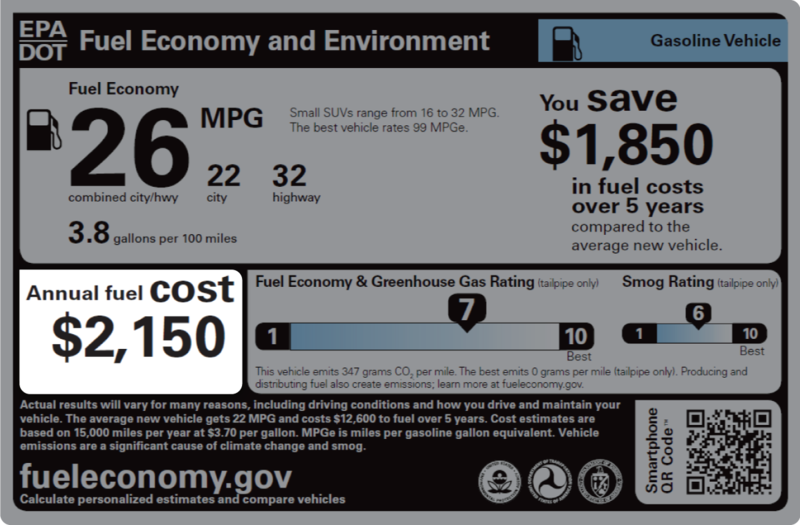 Due in part to the advent of alternative-fuel vehicles (such as electric cars), the EPA and the National Highway Traffic Safety Administration have revised the EPA fuel economy and environment labels that appear on the window stickers of new vehicles beginning with the 2013 models. Some automakers may have voluntarily adopted the new labels earlier for 2012 models. 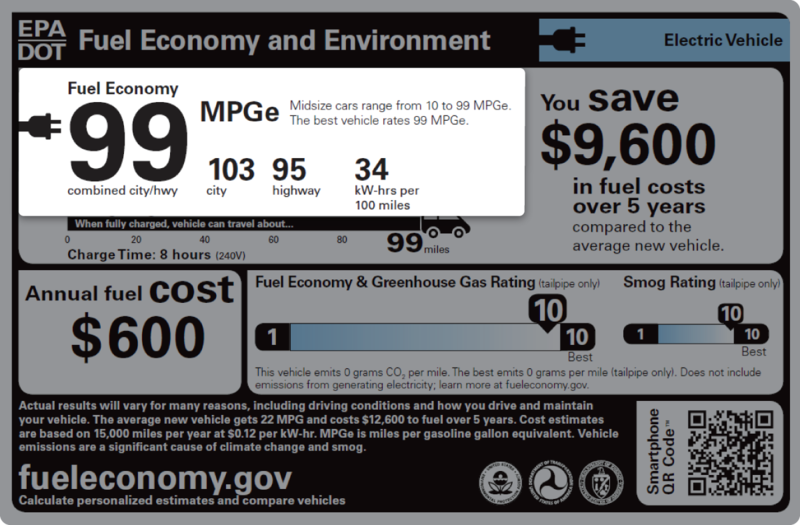 Shown are the new labels for conventional gas-powered vehicles and electric vehicles with descriptions of certain sections. 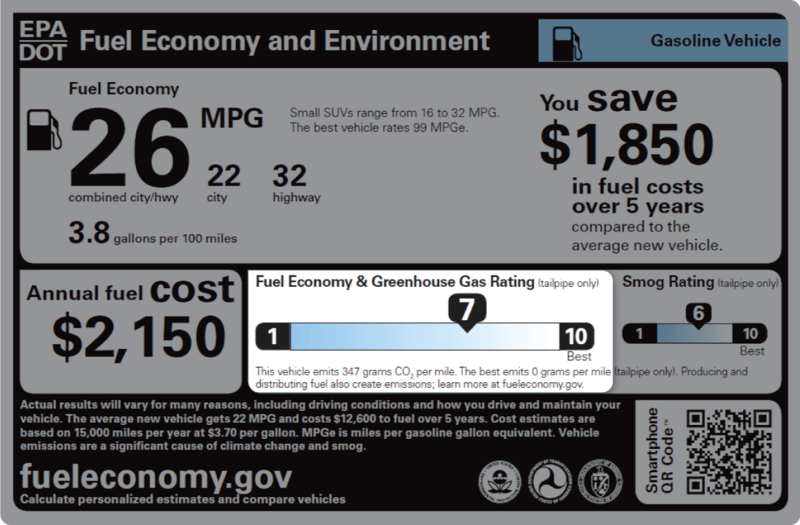 Other EPA labels—including those for diesel and “flex-fuel” vehicles—along with more information, can be found at www.fueleconomy.gov.